Virtually any performance is enhanced and made magical at Royal Albert Hall. To see a legend like Paul Weller there? Amazing. Legend? You may well wonder. Perhaps, you’re at a Memorial Day Weekend BBQ, where someone’s ipod is playing a tiny tune by a hot Pitchfork band with an 18 syllable name, which, mnemonic devices failing, you’ve already forgotten. Oh, wait, Mnemonic Device is their name! Rest assured, in the UK, Paul Weller is exactly that. He was recently bestowed with NMEs Godlike Genius Award. Not to mention, winning Best Male Solo Artist at the BRIT Awards in 2009. Not to mention, his considerable body of work. Royal Albert Hall is one of the most iconic Victorian buildings in London. True to form, it’s gilded to the gills, bedecked in red velvet and resplendent with arches and columns. It is said, that the reason such a massive, brick behemoth sustained so little damage during the Blitz of WWII, is because the Germans used it to navigate London by night. Bless their souls. The only nod to the modern day, is an acoustical treatment consisting of giant, puffy ellipses suspended from the ceiling, like upside down mushrooms. On this occasion, the outer rotunda of the Royal Albert Hall was filled with stunning portraits of Mr. Weller-Through-The-Ages. Legions of mod Weller loyalists aged 10 to 70 (no exaggeration) were happily swanning around RAH. Through the many stages of Mr. Weller’s musical evolution, not to mention his ever changing moods, he has always been a Mod (of some iteration), and his most dedicated fans, even more so. As if to say, “If we can’t be our hero, we can at least out-dress him”. And, they did! I saw more Fred Perry and Ben Sherman shirts, Merc suits, bespoke Italian shoes and the ubiquitous Small Faces haircut, than I’ve ever had the pleasure of clapping eyes on, in my oh-so-short, sweet life. Mr. Weller has been rattling around the music business for nigh on 40 years, now. You may, like myself, be a massive Jam fan, found Style Council a bit overproduced and pretentious and only heard bits and pieces of his solo work over the years, never captivated enough to run out and buy everything, though fully recognizing his talent throughout. 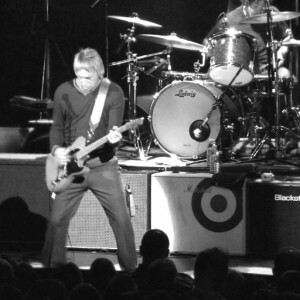 As a live performer, Mr. Weller is a master, which should come as no surprise to Mr. Gladwell or anyone else. His new recording “Wake Up the Nation” is reported to be his best, most interesting and energetic in many years. His voice has more body and soul than ever, it is both disciplined and impassioned. Unsurprisingly, Steve Marriot, Stevie Winwood, and Curtis Mayfield creep out from its timbre. As expected, Mr. Weller does swagger on stage, but it’s integrated so completely into the physicality of his singing and guitar playing that it doesn’t seem as arrogant as it might. His set consisted of a mix of his solo material, Style Council and Jam classics, though not in equal measure, sadly. He opened with “Sea Spray”, an anthemic, U2-like number. The sound is outstanding, the mix perfect, his band fully engaged (and providing fantastic harmonies) and Mr. Weller giving it his all. “Have You Made Up Your Mind”, “Aim High” and “All I Want to Do (Is Be With You)”, are a nod to his old school soul stylings. Songs like “Up the Dosage” “Shout To The Top”, “Fast Car, Slow Traffic”, “Wake up the Nation”, “7&3 Is The Strikers Name” and “Moonshine” were played with an urgency verging on violence. Amazing! An all female string section joined in on many tracks, most poignantly on “Night Lights” and “Invisible”. The psychedelic number “Trees”, was attacked with a head spinning mix-up of fun house angular piano, 30’s Music Hall crooning and raucous power chords. Though interesting, it seems to work better live than on the recording. Surprise guest, Richard Hawley, joined him on stage for “No Tears to Cry”, already a classic soul track, with vampy guitars and lovely piano. Surprise guest the night before was Bruce Foxton (sigh) and Noel Gallagher was rumored to be joining him on May 27. “Start”, even with a false start drum intro, was spectacular. The audience went insane. I saw grown men, with tears springing from their eyes, hugging like it was VE Day…The first one. It was quite a moment. He came out for 2 encores and played acoustic versions of “All On A Misty Morning” and “Brand New Start” among others. I have heard from two reliable witnesses, that in the late 90’s he would finish with “Tin Soldier” by The Small Faces. I would love to have heard he and his band perform that and a couple more Jam songs. Still, an awe inspiring show and an honor to behold. Beyond that, there is a back catalogue of Mr. Weller’s material beckoning and that is something to sing about. Posted on Tuesday, June 1st, 2010 under Shows. You can follow any responses to this entry through the RSS 2.0 feed. You can leave a response, or trackback from your own site.